Epic doom metal band from Sweden led by bassist/songwriter Leif Edling, born out of the ashes of Edling's previous band, Nemesis (13). The band's 1986 debut, "Epicus Doomicus Metallicus" and its follow up, 1987's "Nightfall" are considered landmark releases by many doom metal fans. "Nightfall" saw vocalist Eddie "Messiah" Marcolin joining the band. He would record 2 more studio albums with the band before quitting in 1990. Candlemass continued with vocalist Thomas Vikström for one more album before splitting in 1993. Edling would revive the Candlemass banner for 2 more albums in the late 1990s, both recorded with entirely new line-ups. 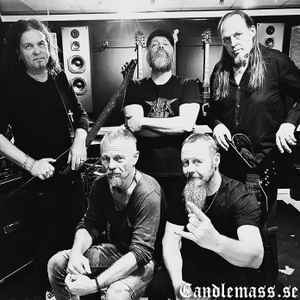 In 2005, the "classic" Candlemass line-up of Edling, Marcolin, drummer Jan Lindh, and guitarists Lars Johansson and Mats Björkman reunited for a brand new, self-titled album. Relations with Marcolin broke down once again, however, as the band prepared a follow up. His replacement ended up being an American singer, Robert Lowe, from the band Solitude Aeturnus. Johan was great on Epicus Doomicus, but as all should recognize, there's only one Messiah ... and his name is Marcolin! I haven't yet heard another vocalist who can do justice to these songs.